This activity gets to grips with what empowerment is all about and stimulates huge amounts of useful discussion. Empowerment is based on the idea that employees' competence, satisfaction and motivation all increase when they are given more skills and resources, more authority and opportunity, while also being held accountable for the outcomes of their actions. This activity tackles this important topic in an interactive way. 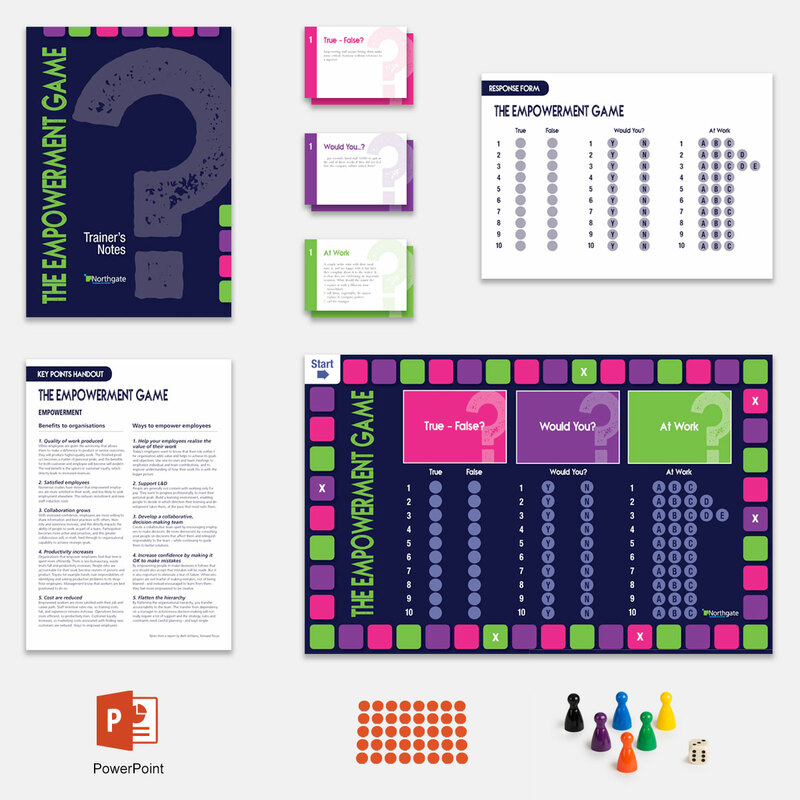 The Empowerment Game includes two game boards, so you can run it with up to 12 participants. Players move around the board using a die and they pick up cards that are then discussed among the group. They make a note (on the board with counters) of their decisions. Usually the group discuss the card together. If, however, someone lands on a square with a cross in then they are empowered to give their own views on the card before it is thrown open up for general group discussion. True/False cards help identify what empowerment is really about and what it is not. At Work cards gives a series of scenarios from real life together with a number of possible options. Teams choose which option they think is best. Would you...? cards put teams in the position of setting company policy. Each card contains details of what a major organisation has done for its employees (eg one company allows staff to bring dogs to work!). 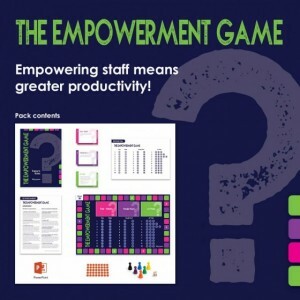 Would team members agree that this is a good idea to help staff become more productive and feel empowered? 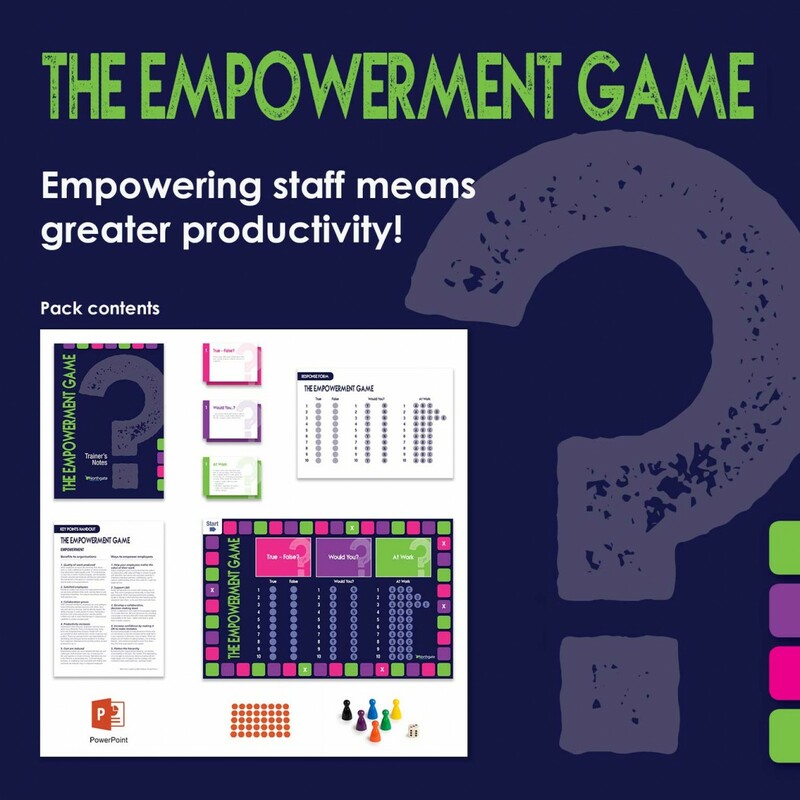 A great activity to raise awareness and stimulate discussions around empowerment. Divide the group into two teams. You can have a maximum of six players around each board - 12 players in total. 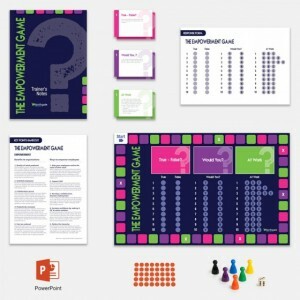 Explain how the game operates verbally or using the PowerPoint. Issue boards, cards and playing pieces and ensure they are set up correctly. Tell teams that once they have used a card, they should place it face-down in an areas off the board. All subsequent cards should be stacked here on top of each other. At the Debrief these cards are turned over to give the order in which they were dealt with. Observe teams playing the game and make notes for the Debrief. Stop the game after a suitable time - normally between 45 & 60 minutes though it can last a lot longer. Lead the Debrief. Ask one team to read out which card they dealt with first (from their upturned pile) and lead a discussion about it using the guidance in the Trainer's Notes. Then ask the other team to do the same - there will be some overlap as they will have come across cards at different times. Review the key lessons that have arisen and issue a Key Points Handout. We find all Northgate activities very intuitive and easy to work with and delegates find them a great benefit. And it helps us promote our brand and company by always coming across as professional. Discovering Northgate Activities has really enriched our delegates' learning.